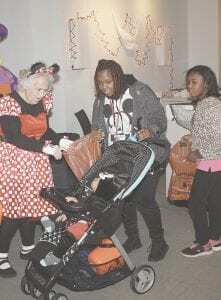 The Little Monsters Halloween Bash at Genesee Valley Center, was held Oct. 27. The spooky Halloween event was the collaboration of the Genesee County 911, the Genesee District Library, Genesee Valley Center and Flint Township’s Downtown Development Authority. There was a Halloween Trunk or Treat Spooky Trail, a magic show and trick or treating inside the mall.